I know. I’m a week late. And you know what? I have officially lost my mind. 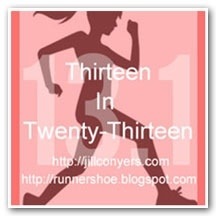 Yes, I have committed to running 13 half marathons for the year. Yep. Most of them will be virtual of course and on the treadmill. 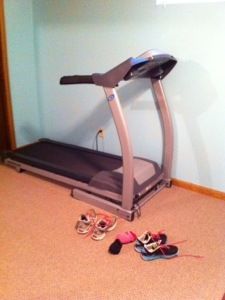 The treadmill is my best friend. 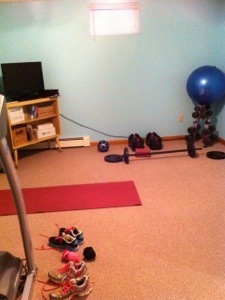 I figured since I have these big plans, I should spruce up my workout room. It had a nasty country western border that was just begging to be ripped off. Took me 4.5 hours, but I did it. I will be starting a running journal and a workout journal. I plan on lifting on off running days so by journaling I can keep track of what I do. I also plan on plugging in my Bodybugg for 30 days to get a “feel” where I am at. Make sense? It’s not going to be easy, but I love challenging myself. I am so excited. I have 7 races in mind so far. Once they’re scheduled, I will share my calendar with you. Have you set goals for the new year? Are you challenging yourself enough to get there? Last week I started to feel as if I was coming down with something. Sure enough, a truck hit me on Christmas day. Joy! So, not only was I sick, but Tyrell was too. We spent the day grossing eachother out with our coughing and sniffling while watching Roseanne. It was a Christmas to remember. I told Tyrell that atleast we’re home together and it was better than a few years ago when we spent Christmas in the hospital with our sick two month old baby. But then I agreed with him when he said, “Yeah, but atleast we got to order Chinese.” So true. My 90 days of Les Mills Pump was supposed to end on Christmas day too. I have 2 more workouts to do and I’m done. I don’t have a set program in mind that I want to tackle. I plan on running alot more, possibly scheduling a ton of races. I need to make my mind up about that soon. 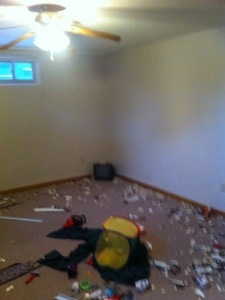 It’s hard to think about running when your lungs feel like they’re full of broken glass. I never get sick, once a year maybe, but when I do, I go all out. It would make me feel better if I could make your day. 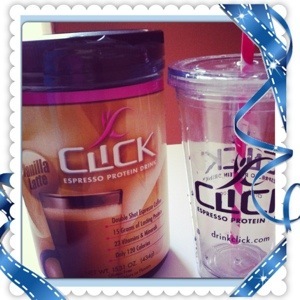 The awesome people at Click sent me a canister of Vanilla Latte Click and a Click tumbler. You know my obsession with my tumblers right? Love em. And look at the cute straw. Awww! To enter this giveaway, I want you to comment below and tell me what your New Year’s resolution is. You get an entry with your initial comment. You can FB, Tweet, LIKE my FB page, etc. just make sure you comment each time so I can keep track. Good luck my friends! PS: If you can’t wait to hear who the winner is, take advantage of their BOGO offer. That’s how I got hooked! Buy One Sample Packet (Mocha Flavor) and Get the Second Sample Packet (Vanilla Latte Flavor) FREE! Check out their yummy recipes too!